Sober Look: Will the Risk Appetite Index buck the trend? Will the Risk Appetite Index buck the trend? 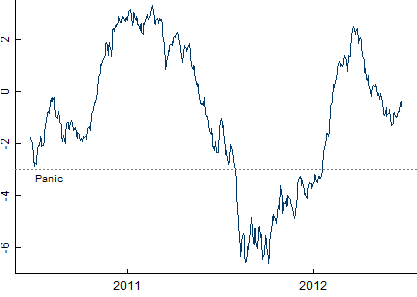 The Credit Suisse Risk Appetite Index has been stuck in "neutral" (somewhat below zero). We are certainly out of the "panic" mode, but given the rate of last year's decline it wouldn't take long for us to get there. 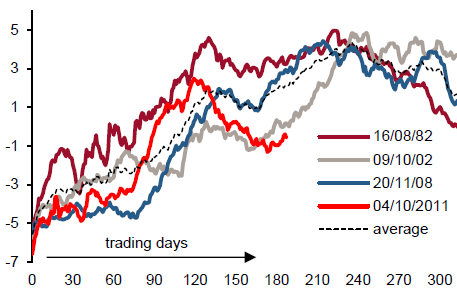 But how does the current trend in the index compare to other "deep panic" recoveries? Historical post-panic trends have been fairly consistent. It shows that we have been on path toward "euphoria" earlier (just as we were back in 2009), but have now fallen below the trend. It will be interesting to see if the current path bucks the trend to the down side, which is a real possibility.